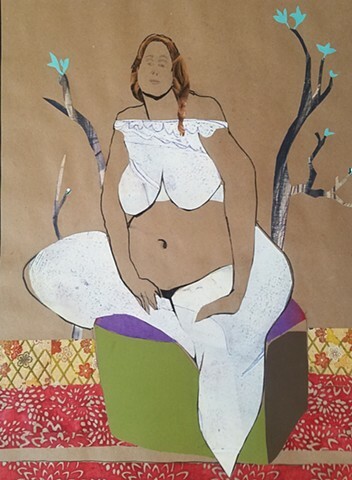 This sweet and beautiful mixed media collage drawing started with a life drawing sketch, and then slowly and spontaneously grew into a collage. The lines of the body are ink marker, the face is pencil, the floor is japanese papers, the box is craft paper, the hair is from a fashion photograph, the white of her legs and top is from an old monoprint of mine, and the trees in the back are made of craft paper and an old print I found. This drawing is an original one of a kind drawing signed and dated by me. It is NOT framed or matted and should be framed and matted to protect it. Artist to retain all copyrights.